Post workout refreshing drink freshly made at home. AAHHH!!! What more can I ask for? 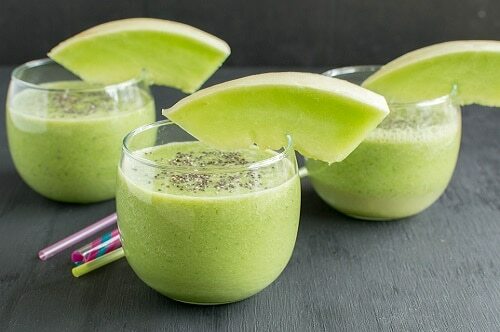 Let’s talk about Honey Dew Melon – though I am not a huge fan of Honey Dew Melon but I loved the flavor and the texture of this smoothie with the honey dew melon as one of the main ingredient. Honey Dew Melon with its smooth light green cover is a perfect choice for hot summer (summer is at its peak here) full of vitamin C, a good source of potassium , high in fiber and its Vitamin B6 content helps in boosting metabolism. Kale as we all know is one of the supreme green leaves bombarded with all the possible nutrition like calcium, iron, potassium, vitamins and minerals and many more and it’s my favorite green food for smoothies. I added chia seeds to add the benefit of super food and protein to my smoothie since it’s a post workout recovery drink and sweetened the smoothie with banana to add potassium and good carbs and blended with pure almond milk. Combine all the ingredients in a blender and blend for 2 minutes or until smooth. Pour the smoothie in a glass and serve chilled. Original plain almond milk can also be used. This looks delicious! A juice bar just opened up down the street from me, and my favorite, the “Detox Greens” has honey dew– I had never thought of using it in juice/smoothies before, but I will definitely start! What a great summer drink. Another great looking healthy recipe! Thanks for sharing, always looking for ways to incorporate more kale! I love the pretty green color and I have always been a fan of honeydew melon. Looks delicious! What a lovely color it ends up being! I love smoothies, and this looks delicious. What blender do you use. The drinks look so smooth. Thank you Sue for trying out this recipe. I am extremely delighted that you loved this smoothie.